Oregon Coast dogs are the most spoiled in America. And why wouldn’t they be? Look at the variety places they get to choose from on any given day, rain or shine. It’s a place that gives dogs what they need. Beaches are great for dragging around huge sticks; rivers are nice for cooling off; the porch at the Rogue Brewery is a perfect place to be admired and petted by passersby. 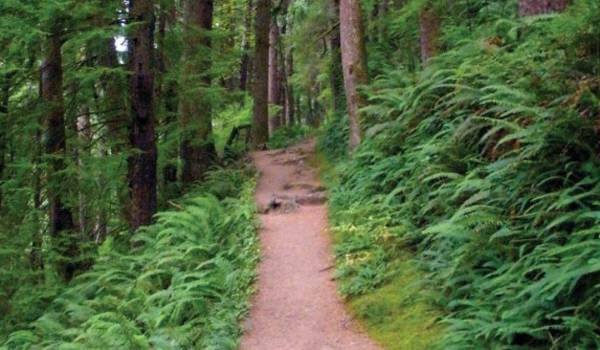 For my enthusiastic black Labrador, Lilo, a hiking trail is the is the best place to spend any Oregon Coast day. 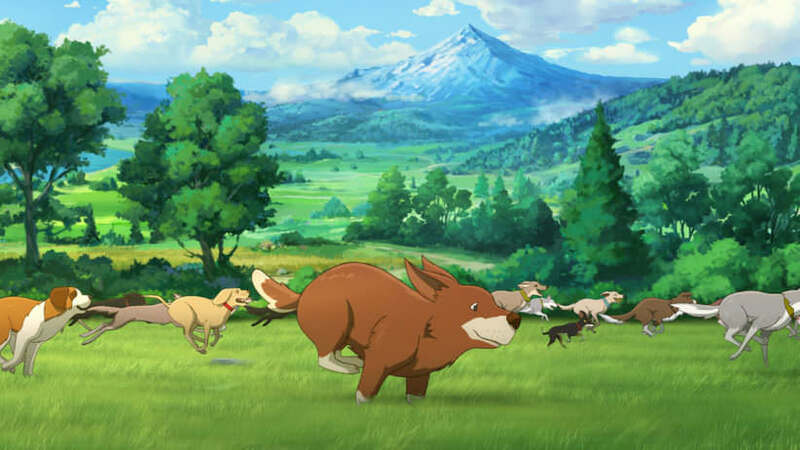 Tuesday marks the start of my “weekend” and for Lilo, Tuesdays have become a sacred day; it’s a day for trails. Tuesday morning starts with a heavy paw to the back of my head at about 5:30 a.m. I mumble grumpily, which only makes Lilo thump her tail loudly against the dresser. It’s her drumbeat, her call to action. “Get up, get up, get up,” goes the tail. Eventually I do, and I stumble to the coffee maker while Lilo herds me nervously, doing her best to make sure I get where she needs me to go, namely her dog cabinet. Within lies her Holy Grail, her trail bag. Actually, it’s just a beat-up old backpack with a rumpled Cannon Beach Hardware and Public House sticker slapped on it, but to her, it means we’re going outside and we’re not coming back for awhile. Trail day is an all-day event and Lilo and I prepare accordingly. Dogs can get excited or agitated around other dogs and people. 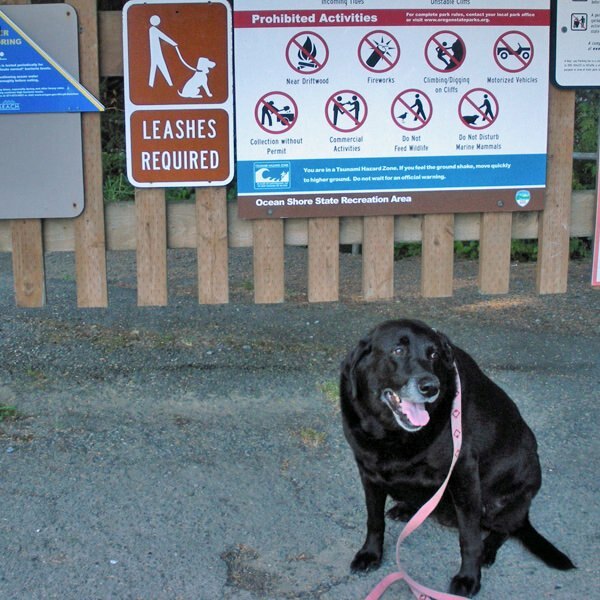 Also, leashes provide a gesture of courtesy and goodwill to other hikers. Size can be intimidating, and Lilo is a big dog, tipping the scales at just over a hundred pounds. Despite her bright pink collar, she has been mistaken for a small black bear from a distance. Collar. Remember some sort of identification for your dog like a tag attached to the collar. Lilo’s includes my name, address and phone number and is reflective. I’ve come across too many frantic dog owners on a trail whose dog bolted and wasn’t wearing any ID. A state park you are visiting for the first time on vacation is an intimidating place to search for your dog. Water/water dish. 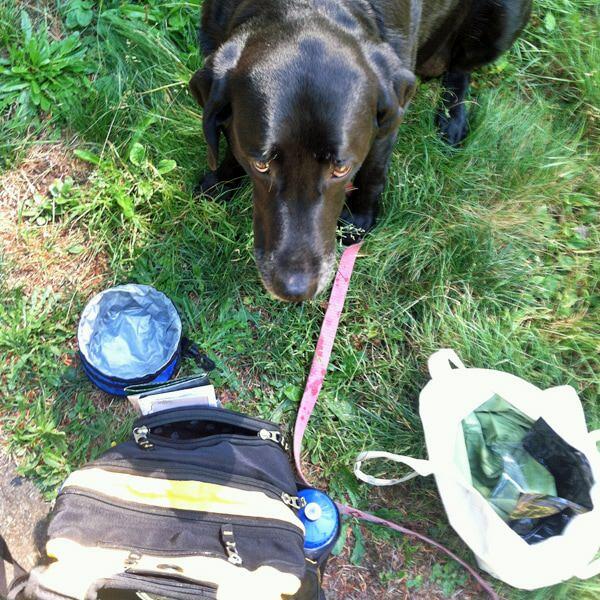 I’ve read you need to carry a quart of water for your dog for every three miles you plan to hike. I paid more attention to that detail after several hikes with my previous dog, Kirby, who preferred to lap run-off water or out of creeks. Nothing teaches you to appreciate pure, drinkable water more than cleaning up after a dog who’s become sick drinking from a trail-side stream. Now I bring plenty of clean water. State parks usually have facilities where you can fill up. Oswald West State Park, for example, has water in the main parking lot. If you hike to a more remote location like Cape Falcon – Lilo’s favorite – there are no facilities. A container for your dog to drink from is essential. I tried getting Lilo to drink from a Frisbee, but she was confused by my attempts. I settled on a collapsible dish that I got as part of a dog “welcome package” when we stayed at a coastal hotel (did I mention Oregon dogs are spoiled?). It’s ultra light and folds flat in a backpack. First aid kit. Since my Boy Scout days, my pack has included a tiny first aid kit with things like gauze, scissors, tweezers, and tape. It now doubles for dog-duty. The most serious dog injury I’ve ever faced on a trail was scraped foot pads or noses, but I error on the side of caution. Snacks. Something to snack on for Lilo is always in the bag, maybe a scoop of dog food or a couple of biscuits. This is partially because we often are out until after her dinner time, but mostly because she likes a reward for getting where we’re going. Camera. Don’t forget a camera just in case some spontaneous doggie cuteness ensues. There’s no way to put this gently: you need to pick up after your dog does his/her business. 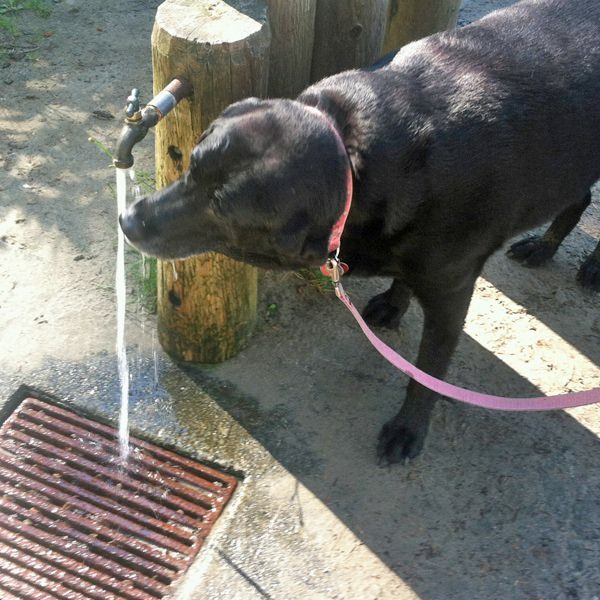 As with using a leash, cleaning up after your dog is a courtesy to other trail users. I can’t tell you how many times I’ve had a good day on a trail marred by climbing into my truck and finding something other than mud stuck to my soles. One more thing; picking it up is only half the battle. Bagging the waste and leaving it by the side of the trail is not “mission complete.” As with anything when it comes to the rules of the trail, if you pack it in, pack it out. Trust me, park rangers will love you for it. Many people just want a quiet, leisurely hike where they can take pictures, watch birds or soak in the sun. Some of them just don’t like dogs. For me, Lilo is a part of my leisurely hike. I couldn’t imagine taking a trail without her. But I try to be sensitive enough not to impose her on everyone I meet. 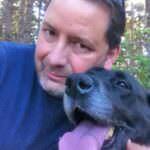 When I see people coming along the trail, I can usually tell by their body language if they enjoy dogs. If they break out in smiles and continue briskly towards us, Lilo’s ears are probably in for a good scratching. Many a pleasant trail conversation has ensued thanks to Lilo. If hikers slow, scowl or stop, they want no part of a dog interaction. I stop and pull to the side of the trail, making Lilo sit. The other hikers can then come to me or pass on by. I like to think the gesture comes off as polite and non-threatening and lets people not used to dogs see them in a new light. It also allows Lilo a chance to loudly snuffle ferns and moss. I adopted Lilo when she was five years old and hiking saved her life. She had been loved but was dangerously overweight. Her early years were spent indoors with an elderly, mostly sedentary couple. She had never run on a beach or up and down a switch back. She needed an exercise regimen and her prescription was a life at the Coast, with miles and miles of forested trails for her to explore and sniff with devout abandon. Hiking has kept Lilo fit and trim and fixed her face with a permanent doggie grin and for that, we both owe our trails a debt of gratitude. Tuesday can’t come fast enough. Born and raised in the great white north of Minnesota, Dan Haag felt the pull of the North Oregon Coast in the early 1990's. After realizing rain never needed to be shoveled, he married an Oregon girl and settled in Manzanita, where he currently works as director of the Manzanita Visitor Center. He is also a freelance writer whose work has appeared in a variety of state and national publications. 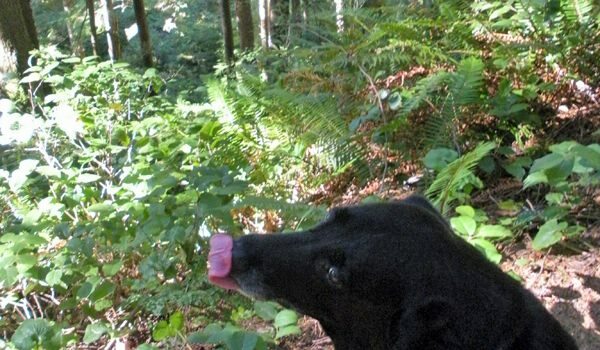 He spends his free time wandering the area’s many trails, supporting the Oregon wine and beer industry, perusing coastal bookstores and chasing his black Labrador, Lilo, along the beach.